This Is Framingham » Blog Archive » No means no! Traffic violations of all kinds around the downtown Framingham area are indeed a major problem. 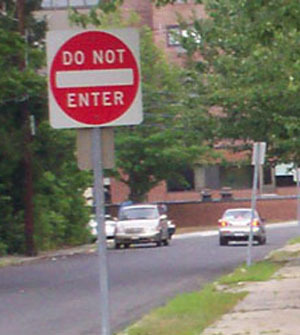 “One Way” and “Do Not Enter” signs are indeed frequently ignored. Sometime you should do a photo and piece about the Harrison St/Dyer St area where I live which has a “New Jersey Barrier” in the middle of the street and a crazy traffic configuration. This morning, I was driving along Franklin St. at 30 MPH (Speed Limit is 25). A female in a mid-sized car was tailgaiting me! The she angrily passed me- crossing a double-solid yellow line – to do so. Shortly thereafter, she “hung a left” onto a small side street. Where was the sense to that? Then again, where is the sense to how most people drive through the downtown Framingham area?! Come check out Central St, pay no attention to the double yellow line, some use that for drag racing 😉 Kid you not! I’ve lived here 8 years. In that time there have been 3 fatalities on this street, two in my front yard/driveway and one 10 houses away. In June, there was a near fatality 11 houses away. There have been 4 other accidents right in front of my house. I live on a straight away too, no turns or anything. Keep in mind that there are alot of people in Framingham who don’t have drivers licenses or anything else for that matter..
MICHELLE WROTE: I feel like I shouldnâ€™t call the police unless thereâ€™s something to show them but maybe Iâ€™m wrong. AMY RESPONDS: Why not use your snazzy camera to take high-resolution photos of the offenders? You can get e-mail addresses for Framingham Police and send the proof along. I recall “chatting” with you a long time ago about complaining versus taking action. If I were you and I had people flagrantly violating the laws in my neighborhood (putting kids and others in danger) I’d take action, I wouldn’t just complain about it on my blog. As I hope you can tell, this blog is for fun and I try to keep it light-hearted and of course I love having people share comments and their stories too. I’ve also learned that people will complain about my blog no matter what- if I don’t do something I have a problem with and if I DO do something I have a problem with, as you know from another post I have a neighbor who is not happy with me “taking action”. I want you to understand though that I can’t just stand at my window with my camera (which is not high-res) ready to go, waiting for a random car to pass by in the wrong direction. I do get busy with other things in my life, even if I do see a car go by in the wrong direction, it just happens too fast to catch on camera unless I’m ready and expecting it. The picture in this post was a rare time I was outside taking a picture of something else and a car whizzed by and I got to take a snapshot. I “take action” in many other aspects in my life but can’t call the police every single time I see someone driving/parking illegally I do sometimes, but not every time and I don’t think it’s realistic to expect that. If that’s what you do, that’s great! More power to you, seriously, but I do my part in my own way which is more than some people do and don’t consider myself as someone who “just complains” on my blog. I just wanted you to know where I’m coming from. Which is while I may make an occasional rant, I do “do stuff” and this blog is a hobby for fun and not really meant to nit-pick, although I realise that is the risk I run with a public blog and I accept that too. I do appreciate you reading though and I’m glad there is someone else in Framingham who must take action as well.